This is twenty-sixth in the series on the rich cultural heritage of ancient temples in India. The ancient temples are exceptionally carved. The external wall and the tower of the Lakshmi Narasimha Temple at Bhadravati is beautifully carved. On the external wall in the middle layer there are various sculptures of Hindu deities. On the layer above one can see carvings that resemble small towers. Similar tower like carvings of bigger size can also be seen on the Rajarani Temple at Bhubaneshwar. The minute carvings in this tower are beautiful and details are amazing. At Jain Temple in Ranakpur the carvings in the temple ceilings are very unique and differ from every other ceiling in the temple. One of the smaller ceiling has carving of Ohm. It is impossible to count number of ohms carved into it. It is a beautiful carving one should not miss. At A.S.I Museum in Shimoga there are several sculptures excavated from various locations in India. One such sculpture is that of Lord Vishnu belonging to the 10th century excavated from Ayanur in Karnataka state. Poetry in stone indeed - remarkable! Magnificent carvings, great details, beautiful photos! Amazing architecture and art work ! Enchanting! Loved the pictures and the apt descriptions! Wonderful to visit your blog and be able to see all these great structures. Never would have known about them otherwise. Your pictures are so amazing, as always. The details are indeed noteworthy. Nice captures of the wonderful architecture. 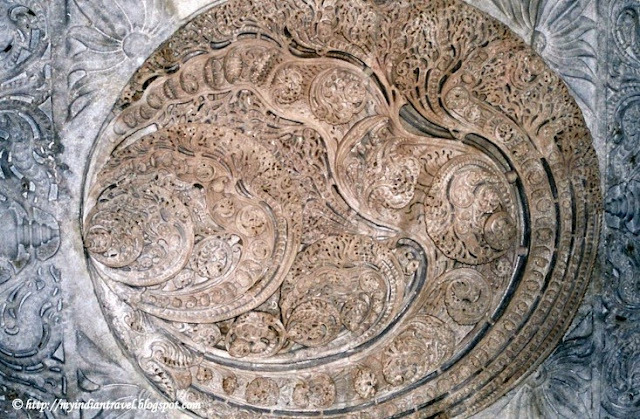 The intricate carving is awesome and beautiful blue skies are the perfect background!! Thanks as always for sharing, Rajesh! Have a great weekend!! These ancient temples you have been sharing all make our jaws drop. I have a question though, do they still build new temples using the same designs? Wow - what a fabulous place! nice blog post on stone temples! Wonderful and full of beauty of art!